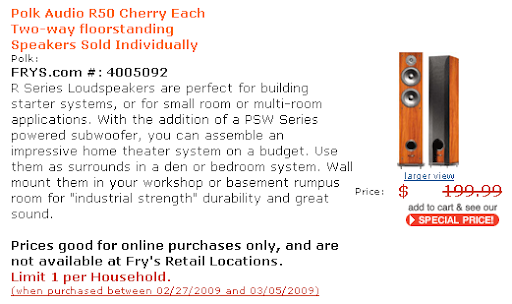 What good is ONE speaker?! i called their customer service and they said it was a known issue and they were working on fixing it. i think (actually it was suggested to me by big a) that one of my coworkers may have worked on their website. anyway, they did get it fixed and i ordered TWO speakers around 10 last night. dude. can you imagine having so much money that you could drop 3 grand on a speaker and not even blink? i would probably wait until i have my lambo before i bought speakers though.